Register for The Fustal San Jose Academy! 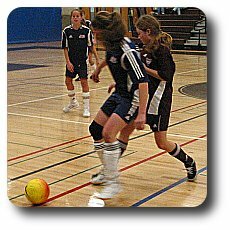 The Futsal San Jose Academy offers first-time futsal players and recreational soccer players a less competitive format in which to learn and play futsal. Academy trainers and officials manage team formation to level the playing field, emphasizing learning the game, developing players, and training coaches -- not winning games and tournaments. Please take this link Academy Information for further instructions after registering. Important: If you want to play as part of our competitive league please sign up with your team (you can not register for the competitive league as a player, only as a team). Step 3: Make sure the form gets printed, sign it, add a passport-sized picture of the player, a copy of proof-of-age (birth certificate, passport, etc.) and a check. If you register on or before November 9, the fee is $95. If you register after November 9, the fee is $115. Make check out to "Futsal San Jose;"
Step 5: Every player must also register with USFF (United State Futsal Federation) for insurance purposes. Fee is $9. Click this link to register -- USFF. Note that the number of players is limited, please register early to make sure you can participate! Work Phone: - - ext. *Read the following information and check each box to indicate your agreement. As the Parent or Legal Guardian of the above name player, I hereby give consent for emergency medical care prescribed by a duly licensed Doctor of Medicine or Doctor of Dentistry. This care may be given under whatever conditions are necessary to preserve the life, limb, or well-being of my dependent. I, the parent/guardian of the registrant, a minor agree that I and the registrant will abide by the rules of Futsal San Jose, its affiliated organizations and sponsors. Recognizing the possibility of physical injury associated with minisoccer and in consideration for Futsal San Jose accepting the registrant for its Futsal (5-A-SIDE/Minisoccer) programs and activities, I hereby release, discharge, and or indemnify Fustal San Jose and USFF, its affiliated organizations and sponsors, their employees and associated personnel, including the owners of gymnasiums and facilities utilized for the Programs, against any claim by or on behalf of the registrant as a result of the registrant's participation in the Programs and/or being transported to or from the same, which transportation I authorize.